This wasn’t (l’havdil) The Titanic. We all arrived in Israel, baruch Hashem, safe and sound, albeit greatly inconvenienced. I feel like that is important to remember. I do appreciate El Al’s rigidity regarding security. But when it comes to weather and traffic in New York City, there is no room for rigidity. The whole balagan could have pretty much been avoided if El Al had simply used common sense and picked up its crew from the hotel earlier. If the passengers could leave to the airport early because it was snowing, why couldn’t the crew? Safety: It has been reported that the pilot told everyone to sit down so that he could return to the gate, but once they sat down, he took off instead. I felt that the cabin was not properly prepared for takeoff. While the passengers were seated, some had cellphones out, and the crew did not do the usual pre-takeoff checks for seat belts, seat backs, and bags under seats. The passenger sitting next to me did not have his seat belt fastened until the plane was accelerating down the runway. Thank G-d there were no injuries. Communication: There was little communication, which contributed to passengers’ uncertainty and anger. And despite the flight leaving from New York City, many announcements were made only in Hebrew, leaving English-only speakers, like me, in the dark. Violence: Passengers of all stripes were raising their voices: the Shomrei Shabbos were agitated about the onset of Shabbos approaching, and the secular were upset that the flight wouldn’t go straight to Israel. But I certainly did not see any violence of any sort. There was nothing near a “riot.” Passengers of all religious backgrounds seemed to me united in their desire simply to get to Tel Aviv safely and on time. For the most part, the vast majority of passengers were polite and convivial. I was sitting in a mixed group – chareidi, Modern Orthodox, and secular – and everyone was friendly, sharing what they had with each other. I don’t appreciate this false narrative that’s being put out that somehow the “ultra-Orthodox” and the “secular” Jews were fighting. We were seated among a mixed group of Jews. We certainly felt for the woman who was anxious to get to Tel Aviv to see her teenaged daughter, the family behind us observing their son’s bar mitzvah, as well as the older couple who were nervous about observing Shabbat. We all shared food, I translated for the woman next to me who spoke only Spanish, and no one in our section lashed out at any other passenger or member of the crew. At breakfast time, in our section, the crew passed out mehadrin meals, and then simply stopped serving. The non-mehadrin passengers in my section (I was seated in back of the plane) did not receive any breakfast. I gave my omelette to a woman sitting next to me, as she had not had any food. The crew refused to serve hot drinks to the passengers, who had by this point already been on the plane for 10 hours. This is absolutely inexcusable. I might suggest that El Al train flight attendants in conflict management. Taking a few minutes to acknowledge peoples’ serious concerns, rather than being defensive, would have gone a long way in making passengers feel heard and understood. And of course, offering a concerned passenger a bit of food or drink could have gone a long way in resolving anxiety and concern. Finally, I want to acknowledge a few things that El Al did right. For us, stopping in Athens was the right choice. I heard that some of my fellow Shomrei Shabbos Jews had preferred to have the plane fly straight to Israel and sleep in Ben Gurion Airport over Shabbos, but for the women traveling with babies and small children, the elderly and the disabled, that choice would have been untenable. After so many hours of traveling, personally, I was relieved to have a bed and a shower. Of course, I would have preferred to make an on-time arrival in Tel Aviv. But barring that, I was glad not to have to spend Shabbos in an airport. The Sofitel hotel that El Al put us up in was lovely, the staff accommodating and as many have noted, the Chabad shluchim, Rabbi Mendel Hendel and his wife Mrs. Nechama Hendel were simply amazing. And Mrs. Hendel treated the ladies to an impromptu lesson on the history of Jews in Greece. El Al had only made arrangements initially for 80 people for Shabbos; there were in fact about 150 just at the Sofitel (and about 20 more at the Holiday Inn). But the food was delicious and plentiful, as everyone shared what they had. Rabbi Jesse Horn, of Yeshivat HaKotel, who was sitting near me, offered me half his chicken dinner Friday night. Some of the ladies gave the men their siddurim for the minyan. Men who had bought expensive Scotch at duty free were giving out shots to everyone. It was all very beautiful. How the Hendels put this thing together at the last minute was unbelievable. I have no idea how they did it. 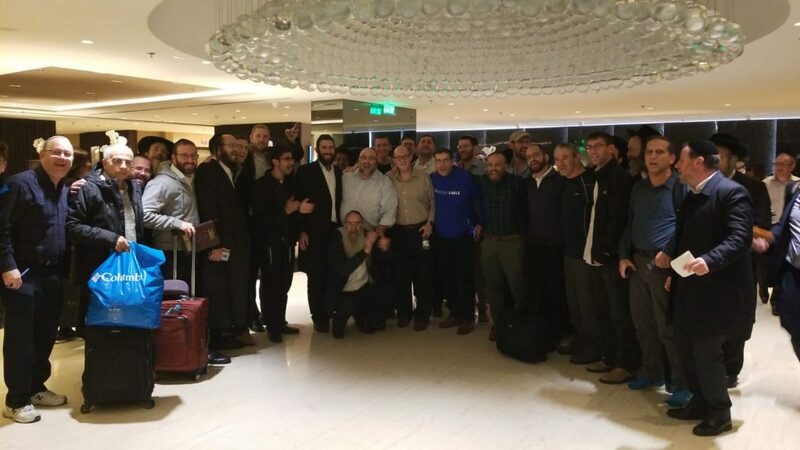 On the same Friday night, they had 130 people at their Chabad House – but they instead stayed at the hotel with us the entire Shabbos!